So my last good run had been 28 days ago. I know I've mentioned the knee pain I had been having but think I forgot to mention that I wasn't running. Sure, there were a few futile attempts where I'd make it less than half a mile, but no mileage to speak of. Biking, yep. Elliptical, yep. Swimming, once. Last Friday (like 10 days ago Friday), I saw a chiropractor (cheaper than an MRI) but he said he couldn't feel anything "wrong." Feeling defeated, and not like spending money on another doctor , I decided to take a week completely off. No gym, no weights, just disgusting inactivity. All of that laying around got me thinking about my injury. I realized that my knee pain started when I switched out of my Mizunos and started wearing a Brooks training flat, usually reserved for speed work or races. I wore them for one run after my Mizunos got really muddy and I was too lazy to clean them. Duh. 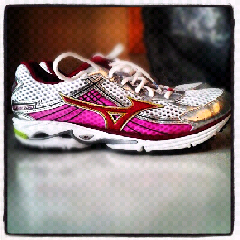 So yesterday, my seventh day of complete rest, I went and got a new pair of Mizunos. Today I ran 5.3 pain-free miles. It was awesome. 1. Sometimes taking a complete break really is the answer. 2. Don't be an idiot and run all your miles in your training flats.